The Fighters start over with a bold shoulder, a mean F and no corporate hyphen. This spacious 2-bedroom co-op offers cathedral ceilings and a private garden. Search for more Brooklyn apartments with outdoor space on realestate.nytimes.com. he Nippon-Ham Fighters are the ''Fighters,'' not the ''Ham Fighters.'' That is, Nippon-Ham is the owner of the team, which plays in the Nippon Professional Baseball league in Japan. It's simply a bit of misfortune that the organization's full name suggests lunch-meat gladiators. Is it any wonder Fighters management ached for a change? So this off-season the team is moving far, far away from Tokyo and the Giants in order to establish a brand-new identity on the northern island of Hokkaido. There the Fighters will play in the Sapporo Dome -- a gorgeous modern stadium named for Hokkaido's largest city -- and they won't even have to share it with another baseball team. New city, new stadium, with luck some new fans -- perfect time for a total image overhaul. And that includes the most important element of all, the key to any brand and, above all, to any sports franchise: the logo. The fighters drafted SMJ, a Tokyo sports-marketing firm, to make over the image. According to SMJ, this is a first; previously, all logo-design work for N.P.B. teams had been handled by Japanese ad agencies. Then again, neither did the Fighters' existing mark -- ''mark'' being industryspeak for logo. It was a cartoon knight in a helmet with its metal visor down, waving a baseball bat like a sword. N.P.B. teams favor childish, cartoony logos that no self-respecting teenager, or adult, would ever wear. (And they don't: N.P.B. licensing revenues are meager, while Major League Baseball licensing is growing at more than 40 percent a year in Japan.) Even the Yomiuri Giants symbolize themselves with a cartoon rabbit known as the Giabbit. But the Fighters longed for a logo that wouldn't look out of place on a team in Major League Baseball. A logo that would not only sell T-shirts but maybe even also win some newfound respect. So SMJ brought in SME, its New York-based partner, to design a new set of marks. SME has made logos and uniforms for hundreds of pro and college teams in every major sport for the likes of the Seattle Mariners, the New Jersey Nets and the New York Rangers. SME designers suggested four possible graphic directions. The retaining shape suggests a baseball diamond; the typeface conveys a fast and forward-leaning feel. Even more than before, the text wins, with ''NHF'' the focal point. SME says it was looking to design ''for the 31st Major League team'' with this mark. ''These uniforms have to walk on the field and compete with the Seattle Mariners, the Florida Marlins and so on.'' SME feels this is where sports-mark design is at right now. SME expects this look to be the next step for M.L.B. teams. The retaining shape is again a diamond, but this time the angles, edges and ''shards'' create ''energy and dynamism'' and ''a bold brand statement.'' Neither text nor figure wins; abstract geometry powers the mark. With the Sapporo Dome arguably the most high-tech stadium in the world, SME saw a chance to couple a unique, forward-looking stadium with a unique, forward-looking mark. In general, the trend in sports marks has been away from figure and detail toward text and abstraction. Look at the mark of the N.H.L. 's Florida Panthers. As an SME designer explains, the 90's style was all three-dimensional detail, coming at an observer with claws and teeth in carefully illustrated ferocity. In contrast, marks today are minimalist: clean typefaces and conceptual shapes carry the logo. Words replace humanoid and animal characters. SME's design for the Nets is essentially a triangle with the word ''Nets'' inside, but the triangle has depth and weight and leans forward, while the text appears to expand. The goal here is to sell some hats and T-shirts, but there's more to it than that. Logos, whether symbols of a sports franchise or a multinational corporation, must encapsulate the entire organizational philosophy, mission and brand identity in a single diminutive graphic. As SME puts it, a mark ''must be able to communicate in the 1.2 seconds it flashes on-screen.'' Success is when every emotion the consumer feels for a brand becomes inextricably woven into that one image. Stamp a logo on a T-shirt, and suddenly that T-shirt lets you wear all those emotions. Works for endorsements too: put the logo on a box of cereal and somehow the cereal tastes like those emotions. That's Branding 101. Not that weaving a brand's emotions into a mark is easy to do from scratch. The Green Bay Packers logo, nothing more than a G in a circle, might not make it out of a design shop today. But the narrative of the franchise has, over time, endowed the mark with so much passion and tradition that its value is nearly immeasurable. Before SME redesigned the Seattle Mariners logo, the team ranked 26th in the league in merchandise sales. The logo, a simple M in gold and blue, ''had nothing to do with the region, or the team, or anything,'' says an SME executive. ''We added a compass rose, a baseball and Pacific Northwest green.'' In one year, the team moved to seventh in merchandise sales. More important, the Mariners seemed to establish a whole new relationship with both their fans and the region. Perhaps it is just a coincidence, but the team started winning too. Upon seeing the opening round of designs, Fighters management immediately ruled out all human figures. They didn't want an actual fighter to represent the team, preferring instead the notion of fighting spirit. This eliminated the Traditional Heraldic mark. 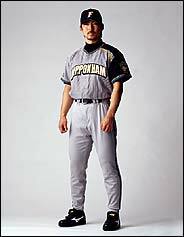 And the futuristic looks of Contemporary Baseball and Baseball Forward, which SME's designers favored, were a bit too radical for the Fighters. It was enough of a risk to break from the hidebound style of N.P.B. logos. That left Contemporary Heraldic. But the Fighters felt the silhouette of Hokkaido and the mountains were ''too obvious.'' They wanted something modern, classy, conservative and right in line with current M.L.B. logos. SME came back with a mark not unlike the one for the Mariners: a baseball centered on a set of points. But while the Mariners logo is a compass rose, the Fighters' is a seven-pointed star -- a longtime symbol of Hokkaido's early pioneer settlers. (Sapporo beer uses a star logo as well.) The ''Fighters'' text wins, but the prominent baseball leaves no doubt what this brand is about. The corporate name is present, but regional identity is heavily emphasized. Because this was the rare redesign case where even the palette was up for grabs, SMJ conducted additional surveys to find a color scheme that fit Hokkaido. Locals suggested that a rich gold tone might bring to mind several Hokkaido themes at once: the bare earth of the hills, the tasty skin of Hokkaido potatoes, the bubbly hue of a glass of Sapporo beer. The star was colored gold. Finally, the mark was subjected to the all-important ''squint test'' -- how readable would it be up in the corner of a small TV screen? The test revealed the word ''Hokkaido'' was a tad too tiny and needed a larger typeface and more space to spread out. Done and done. The last steps were new uniforms and a new mascot. To give the jerseys a fresh style, SME went for an asymmetrical look, with a single black shoulder. ''The black really makes it pop,'' says one SME executive. It's a look SME thinks is unique in world baseball. The previous mascot was an odd-looking, bright pink bird named Fighty, so misshapen that it hardly resembled a bird at all. One SME worker, in a moment of confusion, thought it was meant to be a ham. So SME sketched several new options. One was a giant lobster with a glove on its left claw. (Hokkaido is known for its seafood.) Another showed an anthropomorphized narwhal -- you know, the sea creature with the horn coming out of its head. SME would not even release this sketch, apparently out of embarrassment, but I recall seeing a small baseball cap set jauntily beside the narwhal's horn. In the end, the Fighters chose a bear. But not just any bear. It's an attitudinal bear, the kind of mascot that ''taunts'' the opponent. As of this writing, the mascot outfit is undergoing special tailoring -- modifications that will let its wearer sprint around the stands and even do back flips. The bear has not yet received a name. Seth Stevenson last wrote for the magazine about refugee housing.